My appearances on actual radio (as opposed to podcasts) goes in spates. After my Smithsonian magazine article appeared about the entry of 1923 in the U.S. into the public domain, I was asked to be on several shows. WNYC interviewed me for a brief segment on the public domain that ran on January 4. On Jan. 9, I recorded a long interview with WGN in Chicago for a segment aired Jan. 13 on the same topic. In all the recent discussion about podcasting having arrived — with a lot of reliance on Edison Research's most recent in a multi-year series of interviews about radio and audio-program listening — nobody seems to have connected two numbers. The Pew Research Internet Project's Social Networking Fact Sheet pegs regular Twitter use at 19% of online adult Americans. That's people 18 or older who use the Internet regularly, which Pew says elsewhere is about 87% of adults. Edison helpfully notes that the 15% figure represents 39 million Americans. There are 309 million people in America as of the 2010 census, and the Census Bureau says 23.3% of them are not yet 18 years of age. Thus 76.7% of 309 million gets you 236 million; take 87% of that for online adult Americans, and it's 205 million; 19% who use Twitter regularly would thus mean…39 million. A podcast and Twitter aren't comparable in nature. Someone might listen to one 30-minute episode of a radio show or their local church's sermon once a month, while they participate on Twitter every day; the opposite is also possible. Yet given the attention paid to Twitter, it's reasonable to think that podcasting quietly arrived at a viable mass market when no one was looking. It took Serial for people outside of radio and podcasting to pay close attention. Twitter's growth has slowed, especially for active users. Podcasting has by no means reached its top, and it's likely to be driven higher by a critical mass of adoption and shows like Serial. The number of podcast listeners could start to approach Edison's figures for online radio listeners: about 47% of the 12+ population in America, or about 124 million people. For people who love listening to and making podcasts, 39 million is a very nice potential audience, but striving towards 124 million sounds even better. The Incomparable: All about my Jeopardy run, along with discussions of the game-show genre, especially Andy Ihnatko's favorite, The Amazing Race. The Talk Show with John Gruber: we talked Jeopardy, my job at The Magazine, Microsoft's Surface, Apple job shuffles, and more. Horace Dediu, the smartest mobile industry analyst, runs Asymco, but has a podcast called Critical Path. He launched a second one with interviews called High Density starting with yours truly. I explained some of the economic issues with Jeopardy, told him what I know about how The Economist works, and discussed modern journalism. Marketplace Tech Report had me on to talk about algebraic data packet oversampling (seriously), but they also quizzed me about my game show experience. David Sparks and Katie Floyd invited me on to Mac Power Users, where we got into workflow and my favorite apps for getting things done — as well as Jeopardy. Unrelated to all these, I launched a new podcast series, The New Disruptors, about how creators and producers use new technological means to connect with audiences. It's an eclectic show bound together by talking to people about making things and ideas for themselves. I've put out five episodes so far in the weekly series. Hey, I was on public radio's Talk of the Nation: Science Friday. I spoke with host Ira Flatow about Google's purchase of Motorola and the competitive landscape of smartphones and tablets. What a treat. Great interviewer, smart guy, and it is fun to be on national radio.If you prefer your radio in written form, there's a transcript available (free, not like the olden days) on the Web. I was interviewed on the BBC "The World Today" program airing 1 July 2011 about Lytro's recently announced "no-focus" camera, a hardware example of computational photography. I'd written an item that ran yesterday in the Economist's Babbage blog on both topics. Oh, we're going to talk about the Doctor in a future episode. Don't you worry. Ah ha ha ha ha mwah ha ha. Public radio has this thing they call a driveway moment. (Oh, Mary, mother of God, it's not just something they call a driveway moment, it's something they have obtained a service mark for--so it's a Driveway Moment[sm]. )Anyway, the idea is that you are listening to a story so compelling that when you arrive at your destination, like your home driveway, instead of turning off the radio (how quaint, listening to a live broadcast but that's the demographic), you sit in your car and listen to the rest of the piece. There are a lot of implications in that which have to do with the driveway. You drive a car. You have a driveway. You have the time (or will make the time) to sit in the car instead of going instead. You got it: 40-60 year old Caucasians living in suburbs. Anyway, again, the modern driveway moment is different for me. I plug my iPhone into an integrated car stereo which charges and plays back content directly. I listen to a podcast; this morning, it was one of my favorite NPR productions, Planet Money, which exists only as a podcast with some pieces also being aired. I arrived at my destination, and the piece is so interesting, I don't stay in the car. I unhook the iPod, plug in my headphones, and listen to the rest of the podcast as I walk to work. When I arrive at work, I dock the iPod and continue to play it, now through speakers in the office. What's that? The Intermodal Playback Moments? I don't know what to call it. 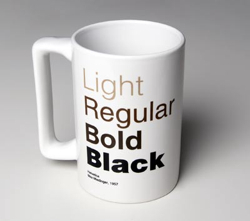 This week, we talked about the Starbucks/Apple deal for iTunes access and what's playing in the stores; Amazon.com's protection-free MP3 beta store; and coffee mugs that have Pantone colors printed on them, coffee colors printed inside, or, in one I didn't mention, typefaces on the mug combined with coffee colors. KUOW has set up a podcast feed (or rather continued an existing one) for The Works, the segment in which I'm a guest every Wednesday at 2.07 pm on The Beat. You can also subscribe via iTunes. This week, I talked about Link Love, or why Google loves some sites more than others. I also mention splogs, comment spam, and even mention blam!